This easy-to-use resource allows you to flexibly train yourselves or others on campus anytime of year. You can pick and choose from among several options in core sections and follow the step-by-step guide to jump-start or maintain your partnership with the CRS Student Ambassador Program on your campus. When you submit your action plan, we will consider you a CRS Student Ambassador partner! Email university@crs.org with any questions. Each Fall, CRS University offers training opportunities for students and accompanying staff to equip them to start, deepen and grow their CRS Student Ambassador chapter on campus. A core group of students plus a staff advisor from each university are invited to attend. 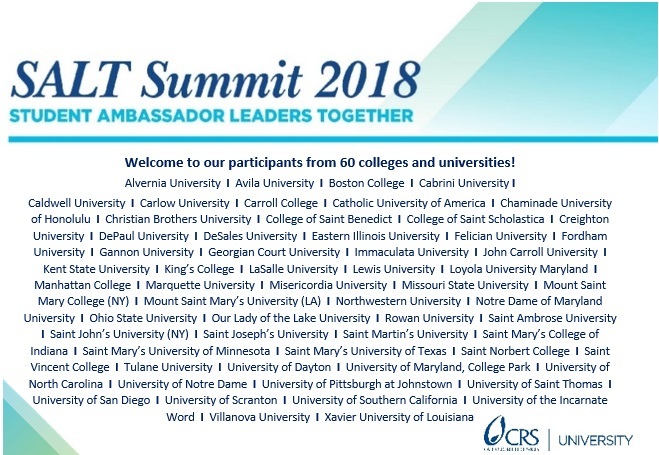 We welcome universities who have been partnering with us for many years as well as new universities who are interested in building a relationship with CRS on campus. Check back in Spring 2019 for the list of dates and locations for Fall 2019 training opportunities! At CRS SALT Summit 2018, CRS Student Ambassadors and Advisors had the opportunity to meet others in the national network, connect with CRS staff and experts, build leadership and campus organizing skills, and better understand the global work of CRS and our potential for impact as college students and staff, including advocacy training and preparation as well as advocacy meetings on Capitol Hill with the offices of your Senators and Representatives. Thank you for helping to make the CRS SALT Summit 2018 a success! Below are a few ways to learn, read, see and hear what happened during our time together. Search #SALTSummit on social media for more photos and to see what the experience was all about. 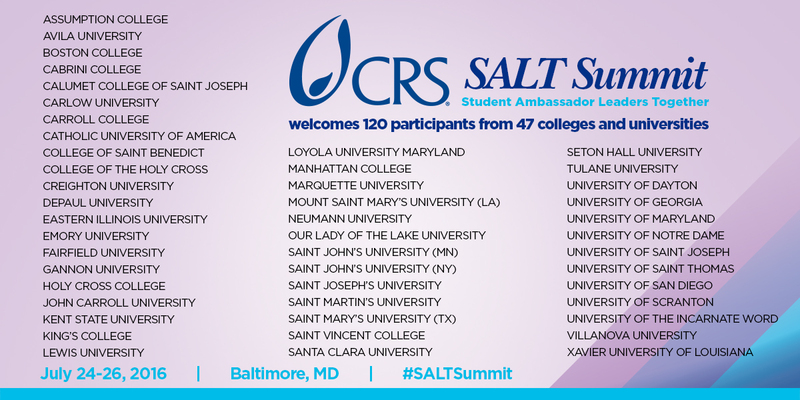 Thank you for helping to make the CRS SALT Summit 2016 a success! Below are a few ways to learn, read, see and hear what happened during our time together. The first ever National Conference was held at CRS Headquarters in Baltimore, Maryland in August 2014 and welcomed representatives from 30 colleges and universities. Read a summary here. Other forms of on-campus trainings are offered on an as-needed basis by CRS staff. Please contact danielle.roberts@crs.org to inquire if you are interested in having a CRS staff person come to campus to train a group of students and staff as CRS Student Ambassadors and Advisors. In particular, if you have participated in the DIY training above, we would love to come to campus for an abbreviated "training" session to follow up with skill-building and action planning for your particular campus context.